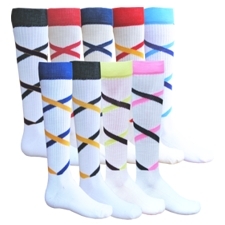 Criss Cross Socks #7679 - great for soccer, baseball, softball, volleyball, cheerleading & all sports! X-pattern stripe, cushioned foot, heel and toe design, 69% Acrylic, 19% Nylon, 8% Polyester, 4% Spandex. All colors are only available women's size 9-11.